Companies are looking at ways to save money, reduce costs, and deliver more value to their customers. That process starts in the office. By updating their processes, it’s possible to increase efficiency without negatively impacting the value for your customers. Printing costs are one area where companies can easily reduce costs and increase savings and efficiency. If you aren’t paying attention to your printing, you may be hurting your bottom line and productivity. But there are simple steps you can take to better manage those costs and expenses. 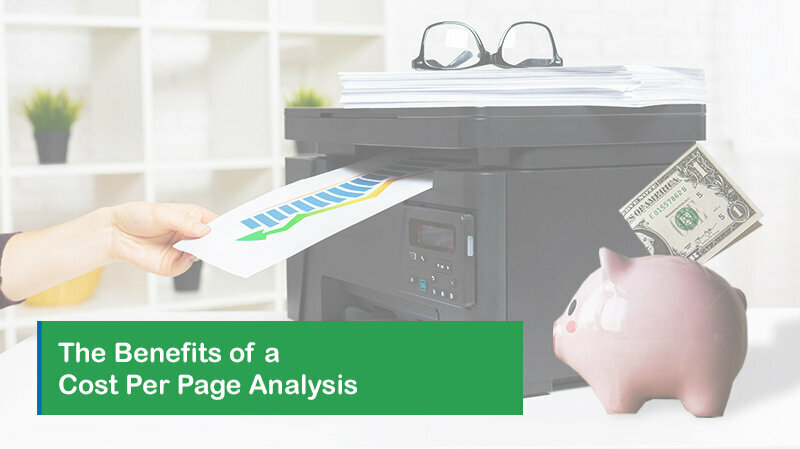 We’ll take a look at a cost per page analysis – an excellent way to evaluate how much you are spending on printing. You’ll also see how managed print services can drastically reduce your expenses and increase productivity. When buying a copier, many companies create a requirement list and then evaluate the upfront costs before making a selection. This is only a small part of your costs. You may end up spending much more than you know on printing. The cost per page (CPP) of printing can vary widely between printers. Every copier and printer, including copiers based on inkjet and laser technology, use consumables that are the basis of ongoing expenses for the unit. For example, the cost of ink, toner cartridges, and paper are added to the overall cost of the copier with every print job. Even though the cost of printing may be very low for each individual copy, the cost over the life of the printer will be significantly higher. In fact, some estimates show the upfront cost is only five-percent of the overall cost of the copier. A cost per page analysis identifies the copier’s cost for each page of printed material. Copier printing costs are dependent on the inkjet cartridges, toner cartridges, and paper costs. Each toner or ink cartridge will have a page yield, or number of pages the manufacturer claims a single cartridge will print. The International Organization of Standards (ISO) has the criteria that manufacturing uses to calculate the page yield. Calculating page yield is not an exact science, and there are several factors that impact print results such as the paper used. Page yield is an excellent way to start to calculate your cost per page. A cost per page analysis is one factor in your overall printing and office expenses, but it is not the only factor. Managed print services are an excellent way to evaluate other areas that may be increasing your printing costs. Managed print services (MPS) help companies manage their business printing devices and costs. As a program offered by print suppliers, experts will evaluate your current printing needs and office processes. They will then help you identify ways to reduce costs, lower your reliance on paper, and increase productivity and efficiency. Managed print services will uncover simple steps you can take to significantly reduce costs and increase efficiency. Many companies suffer from wasteful printing. It may not be the employee’s fault, but the result of a flawed business process or duplicate work. For example, using “local” copiers, or personal printers in an office, will increase costs. These copiers often use more expensive cartridges that the office has to cover. Another common mistake companies make is with printer placement. By placing printers with a lower cost per page – identified from your cost per page analysis – in a convenient location for employees, you can reduce your printing costs and increase office productivity. With managed print services, you will often receive not only an analysis of your current printing usage, but also get ideas for further optimizing your office. This might include additional training for employees, cost-saving processes, and ways to consolidate your printing costs and services with fewer suppliers. This will provide a more consistent and predictable printing cost each month for the business. If you’re ready to start reducing costs and increasing efficiency in your office, consider a cost per page analysis of your existing printers. Get in touch with the team at Donnellon McCarthy and learn more about managed print services for your office. The analysis and services that our team provides will help you understand how you are currently managing your printing needs, and identify ways you can optimize your printing operations. Are you ready to manage and better control your printing costs? Contact the experts at Donnellon McCarthy Enterprises to learn how and why managed print services can help you increase efficiency and lower your costs.